Such an exciting time of year and such an exciting giveaway happening to go along with it! $50 prize package from Mitzi's Collectibles!! Now let's check out the features from last week! Sometimes Twice transformed the ugliest piece into something fabulous! Who woulda thunk it?! Tina's Trashe' Treasures, that's who! 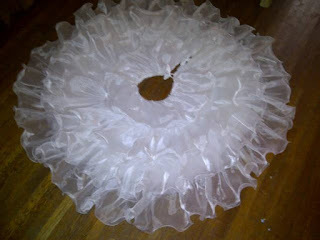 An old wedding dress turned Christmas tree skirt! 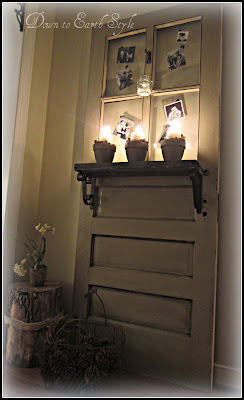 Down to Earth Style created a jaw-dropping display with this old door. Now then, who's ready for this week's party?! Woohoo! Party time!! Thanks for hosting! Thank you for hosting Kammy! Hi Kammy! Thanks for the feature! Made my day! Thanks for hosting Kammy. I am new at blogging so it's great to see your blog with such inspirational work. As always I love seeing all of the party peeps (and amazing treasures) ;) I especially love the Emergency Binder - it's one of my new years resolutions to complete it for our family!